I bought my daughter a kite today on the ride back home from work. Yes, it was a frivolous thing to buy, and I’m perfectly fine with that. As far as I can recall, in all of my purging over the past six months, I can’t recall seeing a single kite. And with an eight-year-old in the house–and all of that wind up on the ridge–it seemed like a perfectly reasonable purchase. After dinner, all five of us (and the dog, of course) walked across the road to the field down by the barn. 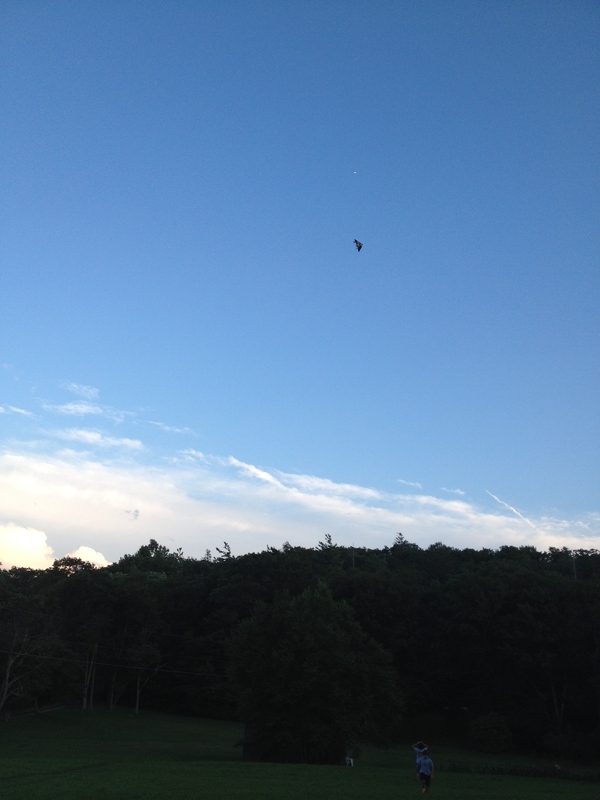 It took us a bit to get the kite off the ground, but after a few crash landings, we had that thing in the sky. We had a blast. Her great-aunt and great-uncle walked down from their house to join us when they saw us out in the field. We spent the rest of the evening talking, laughing, letting out string, and then taking it back in. Of course, when I first told her I had a surprise for her, and then showed her the kite, her response was: “So this is the surprise?” But now, with that kite soaring, she couldn’t have been happier. I suppose flying a kite shares something in common with trimming a sail, so there are probably a few lessons to be learned here, I’m sure. But for tonight, I’m just going to let that kite speak for itself. This entry was posted in Uncategorized and tagged family, pace, simplicity. Bookmark the permalink. Simple pleasures are life’s treasures.